Fees will be collected at the venue. Please arrive early ! Check in is from 4:30pm onwards. Register your team, make payments, and start getting seated during this time. Tournament begins at 5:00pm sharp. Each team will receive two answer sheets per round. They will keep one to check their answers and submit the other for point tallying by the Tournament judges. Write your team name and round number on each answer sheet before the beginning of game play. This will ensure that your team is identifiable once sheets are turned into the judges. Assign a player to record your answers on the answer sheet as well as turn your answer sheet into the judges at the end of each round. There will be short breaks between the rounds, where you can find out the correct answers, go to the bathroom, order food etc. The Tournament has 5 rounds of 10 questions each, with 5-10 minutes per round depending on the category. Each question is worth 2 points and are of varying difficulty. The team with the highest number of points wins the Triwizard Trivia Tournament. The trivia will consist of different categories covering the Harry Potter franchise. This includes the Harry Potter books, movies, and plays, as well as the Newt Scamander movies. There may be bonus questions, rounds as well as a tiebreaker round if required. Correct spelling on the answer sheets is not always required; however, the judges must be able to recognize your answers. Each question has only ONE correct answer. Submitting more than one answer or general descriptions will be scored as incorrect. Neatly write your answers in ALL CAPS using the pencil provided to you. Answer sheets must be turned into the judges table during the time allowed at the end of each round. Changing answers is not allowed once answer sheets have been turned in. Electronic devices or other resource materials are strictly prohibited for use during the Tournament. Teams found to be violating this rule will forfeit the round and will not be allowed to turn in their answer sheet. If you must take a call during the game, please do so outside of the trivia game area. However, you may not rejoin your team until the answer sheet for the current round has been turned in. Correct answers will be announced at the end of each round. The Quizmaster is ALWAYS correct. Please do not debate answers with the Tournament judges and staff. If you feel your team score has been calculated incorrectly; notify staff. The responses on the answer sheet provided to the judges will always take precedence. In the event of a tie, a tie-breaker question between all tied tables will be used to determine the winner. HINT: Keep your team discussions at a low volume unless you want the neighboring team to eavesdrop. Is Triwizard Trivia Tournament a part of CAM’S Hogwart Express program? Yes, it is a trivia night aimed towards older fans of the Harry Potter series. Other activities will be continuing during the Tournament. You may visit the other activities during the breaks if you like. When Is the Tournament happening? Can I walk in at any time? The Tournament will be from 4:30pm -7pm. All teams must be present from the beginning. If your team arrives late, you will not be eligible for the Tournament, so please be on time! If you want to participate in other activities besides the Tournament, you may arrive at the venue at any time between 12pm-4:30pm. How many people can enter in a team? Can I enter individually? A team can have 3-4 members, maximum. You can also enter the Tournament individually and be assigned to a team on the day of the Tournament. 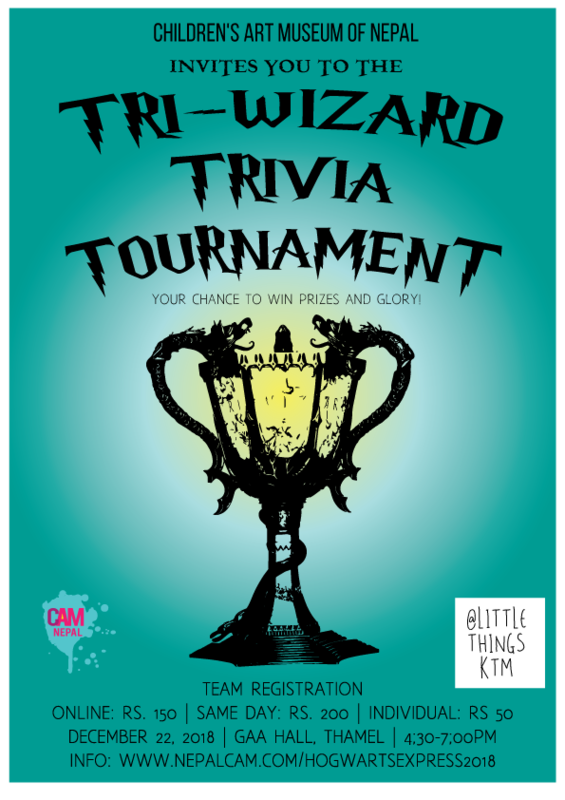 The Triwizard Trivia Tournament is for Harry Potter fans aged 13 and above. What do we receive if our team wins? The winning team will win the House Cup and a prize. The prizes are being sponsored by Little Things and include Harry Potter inspired merchandise. Announcements regarding the prizes will be made in the near future. Where do I pay the registration fee? You can pay the registration fee upon arrival at the Hogwarts Express event at GAA Hall, Thamel. Please arrive by 4:30pm to complete your registration. Can I participate in the Tournament without buying an entry ticket for Hogwarts Express? No, you must buy a entry ticket to enter the Hogwarts Express venue first! We have more questions, whom do we contact? You can email your questions to Pri Bastola (Program Coordinator) at nepalcam@gmail.com or call her at 9843566059.